1. Flooding Nevada and Colorado with LDS volunteers. Folks in UT are getting in touch with the Utah Obama office for phonebanking & canvassing opportunities in NV & CO. People in Nevada, Colorado, (and "Little Provo" in VA) are picking out heavily LDS neighborhoods, finding a friend to canvass with them, and getting in touch with their local Obama office to get a list of targeted doors in those neighborhoods. (We are NOT using ward lists in any way, shape, or form.) If you want to participate or have questions, subscribe to our newsletter or ask in the comments. We also need a snazzy name for this initiative, akin to the "Great Schlep" from 2008, but Mormon-y. 2. Getting even more heavily involved in volunteering with the local Obama for America neighborhood teams. We're finding our local offices and participating in local volunteering opportunities. We're sporting any Mormons for Obama gear we own and otherwise letting our fellow Obama supporters know that at least some Mormons stand with them. 3. Talking to friends and family who live in swing states and are either on the fence or supporting President Obama. We're sharing the President's record with those who are on the fence. We're getting out the vote (early if at all possible) with those who know they want four more years of President Obama in the White House! Two major themes that came out of Tuesday night's call were the importance of letting our views be known so other Latter-day Saints no longer feel like "the only LDS Democrat" or "the only LDS Obama supporter" and the terrific volunteer skills we already possess & our ability to have an outsized impact as we get to work. We can, and we will, make a crucial difference as we get President Obama elected for another four years! We can, in short, be these elves. KSL News in Utah did an interview with BYU students Hannah Wheelwright and Ben Ader - once again making the point that many Mormons will vote for Obama in November. And of course, Hannah is sporting some really nice bumper stickers on her computer. This kind of publicity and dedication is encouraging and energizing - especially to find this reporting on a Utah news station that is operated by Bonneville Communications. So let's make one final push for November! See the article here on KSL.Com, and watch Hannah's interview at that link as well. Additionally, refer to Hannah's article, "Anxiously Engaged" to learn how you can get involved! Let's just admit it now and get it out of the way: Romney looked strong in tonight's debate, and President Obama seemed as if he didn't want to offend anyone. Well, the Presidential race may have gotten a little more interesting - especially because the undecided voters (those who tend to have no idea what is going on in politics) may have been watching this evening. And if they tuned in to this debate without the back story... then maybe Romney came out ahead? The next two debates will both cover foreign policy, and the final debate is focusing exclusively on this topic. And it is here that Romney may have found an opening: there is strong indication that the American officials at the Libyan consulate made several requests for extra security before the attack on September 11th that killed the US Ambassador Chris Stevens and three other Americans there. Additionally, the State Department is reversing its former statements that the attack on the consulate was a result of popular protests due to American-made anti-Muslim video, "The Innocence of Muslims;" the State Dept now confirms that this was actually a coordinated terrorist attack. Romney is rumored to be planning a coordinated attack of his own on President Obama's foreign policy record in order to assert that Obama is weak on terrorists. This would be a much-needed boon after his "shoot-first-and-aim-later" statement on the evening of the attack in Benghazi and then his 47% comment that caused some Mormons to cringe. Romney will need to continue to boost his image after the debate this evening, and maybe this is it. Yes, Romney needs to seize upon this Muslim Moment. But I wonder what is really going on here. Maybe this is an area that Romney should avoid altogether. Seriously folks, this is the President that killed Osama bin Laden. I mean, is it possible that the only voters who might respond to the idea that President Obama is weak on Islamic terrorism are those who believe that Obama is himself a Muslim? Anyway, I am amazed by how many questions still abound about Obama's religiosity and faith, and many come from our fellow Mormon brothers and sisters. Interestingly enough, some of these same Mormons also question the faith and commitment of us here at Mormons for Obama, as evidenced by the constant trickle of hate mail we receive. (One would assume that since we Mormons are often challenged regarding our Christianity, we would be careful not to level the same charges at someone else.) Alas, this is not so. We recently received a comment that expressed a considerable amount of disdain for President Obama and our support for him. The commenter disparaged Obama as a "lover of Islam," and went on to say that she would not allow him to watch over her dog, "less (sic) alone my grandchildren." (To which I ask, did Obama even ask to babysit her grandchildren?) But she does have a point about Obama watching her dog, although I would add that both Romney and Obama carry baggage in this department; Romney's baggage is on the roof of his car, while Obama's is on his plate. In the end I deleted the comment, seeing that it did not follow our guidelines of civil discourse. Obviously, this begs the question as to why I would review its content here - giving it more prominence than what it possibly deserves. Well, first I wish to correct the assertion that Obama is a Muslim. Clearly, this woman, like many others, believes every anti-Obama email forward she receives in her inbox (which, I will add, is producing another convert to Mormons for Obama. Read this hilarious piece by Mark Saal.) She also must have arrived late to the town hall where John McCain rebuked a woman (and a member of the Blood gang?) for saying something similar. If Obama says he is Christian, why would it behoove us Latter-day Saints to question this? But this leads to an even a more important aspect of this whole debate: it does not matter whether our President is Muslim, Buddhist, Christian, or even a Mormon. In fact, I would vote for Obama even if he was Muslim, and I am pleased that Minnesota elected our first Muslim congressman, Keith Ellison. We are a country of many cultures, ethnic groups, and religious affiliations. If I feel I cannot trust a Muslim to properly represent my views and interests on a national or local level, then why should we expect an American Muslim, Buddhist, or Jew to accept a Christian president? Many people became very upset when a mosque was proposed at a site near Ground Zero. This hostility seemed to imply that all Muslims are somehow responsible for the events of 9/11. However, this public battle failed to acknowledge or demostrate the proper respect for the lives of the many innocent American Muslims who were lost in the World Trade Center attacks. Of course, my argument is not new. Regardless, many people continue to assert that Islam is a violent faith; however, I caution that we don't need to look too far to find violence in Christianity - and I am not just speaking of the Holy Wars: bombings of abortion clinics, Jones, Koresh, Northern Ireland, and Mountain Meadows, all happened under the banner of heaven. I don't know everything about Islam, but I am unconvinced that Muslim Americans are somehow less American than Christians, or that consequently, a Muslim is somehow less qualified to be President of the United States. The Christian Right often states that America was founded on Christian principles, but one only need to watch the season finale of Sorkin's The Newsroom to know that this is not exactly true. Maggie spent all evening to find the supporting quotations from our founding fathers - but it took me 30 seconds: Top 5 Myths About America. (Will MacAvoy, hire me please? --and where were you tonight? The tired Jim Leher could've used your crib notes.) See this article on Wikipedia as well, because Wikipedia is always correct. Believing with you that religion is a matter which lies solely between man and his god, that he owes account to none other for his faith or his worship, that the legitimate powers of government reach actions only, and not opinions, I contemplate with sovereign reverence that act of the whole American people who declared that their "legislature" should "make no law respecting an establishment of religion, or prohibiting the free exercise thereof," thus building a wall of separation between church and State. Adhering to this expression of the supreme will of the nation in behalf of the rights of conscience, I shall see with sincere satisfaction the progress of those sentiments which tend to restore to man all his natural rights, convinced he has no natural right in opposition to his social duties. And by the way Fox Newsies, the Pledge of Allegiance had its famous line, "one nation under God," added to it in 1954 by our other founding father, President Eisenhower. See this article. So Romney can debate on and on and on; some may listen and believe. However, a quick tongue and a smart retort in tonight's contest doesn't obscure the fact that President Obama understands this country (beyond its capitalistic leanings) and its extremely important place in the world at large. And yes - even the Muslim world. Once again, I affirm my support for the President in 2012. This picture appeared on an Italian language news site! Kelly, one of our own, was at a rally in Virginia representing Mormons for Obama! She is proudly wearing her "Mormons for Obama" t-shirt. This shirt, by the way, is available on CafePress.com. And Kelly wasn't even aware she had ended up on a news site - she just knew that a lot of people wanted to take her picture (considering her awesome shirt she wore for the rally!) So, it wasn't until she saw the link posted on our Facebook page that she learned that she was famous. Congratulations Kelly! Great job representing Mormons and representing Obama supporters! This piece was originally published on the site Technorati.com. Interest in Mr. Romney’s Mormon faith is in decline, a shift from the U.S. News and World Report earlier this month, which claimed otherwise. Romney’s Mormonism was at a high point around the 9th of September, but research I performed on the 16th seems to indicate a significant decline. Using the same sources, Google search trends, I found that the media have shifted the focus away from Mormonism. Try a simple Google news search, and you’ll find that the Mormon issue is receiving little attention. Perhaps a better indicator is the graph from Google Trends showing the peak in early September, followed by a rapid drop. As a Mormon, I had mixed feelings about this drop because I will vote again for President Obama, and if the religion issue helps him win, so be it. I have written on this site about the political beliefs of Mormons, ones that might affect Mr. Romney’s approach to national governance. I feared, I must confess, to have our nation run by a member of my own faith. My thinking has changed. I was refreshed to find yesterday the website Mormons for Obama, easing my angst over the Mormon issue because the site demonstrates that our faith can be open-minded, something I doubted. Mormons for Obama state that “we are Mormons and we are for President Barack Obama. We created this website in order to represent the unique perspective of Mormons who are voting for Obama.” My faith in the ability of church members to be open-minded was strengthened. Obama Mormons believe that neither religion nor race define individuals, that Romney is not better because he is a Mormon. My thinking has shifted about the way members of my faith think critically, principally that they can. The Mormon issue is not so important to me now because I realize that Mormons can have open, inquiring minds in politics. This made me think less of religion and more about President Obama as an amazing leader. Obama Mormons believe that Christian and family values are not owned by the Republican party and that President Obama can be the better person for the job, whatever his faith. We believe that, while abortion and gay marriage may cause moral problems for us, education, poverty, equality, and the environment are powerful moral issues as well. We take seriously the statement of LDS leaders that we are politically diverse and are free to vote our mind and heart. Obama Mormons believe in the hope the President inspires, for a future that is blind to color and religion and a country vigilantly united in the struggle against oppression, ignorance, and hatred. I now believe that the shift away from religion is positive. I have more faith that Mormons can be open and tolerant. Mormons are not heretics for believing in President Obama’s plan for the future of our country. One of my lengthiest discussions about Mormonism happened with a high school friend who had just finished his first year at a top-25 dental school. It started with his question: "Why do so many of you become dentists? Half of my class is Mormon: they're all from Utah, they're all married, and they all have two or three kids." While I never answered that particular question, I've had many Mormon friends go to dental school. My wife completed professional school, I'm almost done with a doctoral program. We Mormons are told to get married, have children, and get all the education we can. This leads to a simple fact: despite the fact that we've settled down, we're raising the next generation, and we're working very hard to secure a stable future, we fall into Governor Romney's 47% who pay no income tax, who can't be convinced to "take personal responsibility and care for [our] lives." There are two broad reasons we pay no income tax (though, of course, we still pay sales, gas, and payroll taxes). First, as Ezra Klein lays out, Republican tax cuts have reduced the income tax liability for poor and middle-income Americans, even as that reduced liability is now being used as a reason to cut services to pay for new tax cuts for our wealthier fellow citizens. Second, as FactCheck.org explains, over the last few decades, presidents from both parties have supported and expanded the Earned Income Tax Credit and the Child Tax Credit. This is because they've believed that it was good to encourage people to work and to have children. There's that personal responsibility again. We don't consider ourselves victims for choosing to marry young, go to graduate school, and have a daughter. We've had incredible opportunities, and done our best to only use as much of the social safety net as we needed, and not begrudging others who used more. (If anyone out there doubts the general eligibility of young Mormon student families for government benefits, check out this thread from Mormon Mentality in 2007. It's one of the most epic discussions that has ever graced the Bloggernacle.) We do our best to take responsibility for our lives, both in the here and now and in planning for the future. Four years ago, my wife and I had the opportunity to hear Michelle Obama speak at a rally in North Carolina. She talked about how she and Barack only managed to finish paying off their student loans in 2004, as sales of Dreams From My Father started to take off. The President's also talked about this. Sitting in those bleachers back in May of 2008, listening to the future First Lady as we faced graduate school and having kids, we said to one another, "She and Barack get it. They know what we're going through. They're going to pursue policies that help young families who are just starting out." And so they have. We Mormons are taught to take responsibility, to make choices that can lead to getting an education, to marriage, to children. Many of us are part of the 47%, and many of us are voting for President Obama, because we know he's got our backs. My thoughts in my first post were basically introductory to talking about specific issues; for my own sake as much as anything else I wanted to think through why there are conservatives and liberals within the Mormon camp and how there is room for both (for both government and church, for both progressives and traditionalists). New converts will bring their own backgrounds and beliefs with them when they join the Church—and we’re only talking about American Mormons in all this anyway—but I think that understanding the long history of Mormonism’s relationship with American politics can help us situate our current Mormon moment as it relates to Mitt Romney’s candidacy. So I was excited Thursday morning to see that another friend, Dan Wotherspoon, had posted a discussion on this exact subject on his podcast Mormon Matters, with a lot of people who are a lot more informed than I. It’s definitely worth a listen. If any readers were underwhelmed with my thoughts they’ll certainly be much more satisfied by the four gentlemen on the podcast. So that was where I started, and in the rest of my posts I’ll look at specific issues that face our country and how my faith informs my beliefs about them. But what I hope to do today is look at what kind of political leaders I think the Lord wants us to have—and in a democracy what kind we should strive to elect—regardless of their specific platforms or the form of government in question. I guess I’m asking whether we should have specific moral standards for our public officials—if that’s even relevant—and then, to liken these standards unto ourselves, how Governor Romney and President Obama measure up. It’s a mixed bag and therefore I think a profitable discussion to have at this point in the campaign. So what do the scriptures say? It makes sense to begin with Doctrine and Covenants 134, a statement of belief regarding the Church’s position on government, usually ascribed to Oliver Cowdery and written in Joseph Smith’s absence during a conference in 1835. This was when Mormons were first beginning to be seen as un-American because they allegedly sought to govern themselves autonomously, akin to South Carolina in the Nullification Crisis of two years earlier. Section 134 thus seeks to define what the Church believes to be the proper role of government and of religious societies, and it only briefly touches on the desired character of government officials: verse three reads: “We believe that all governments necessarily require civil officers and magistrates to enforce the laws of the same; and that such as will administer the law in equity and justice should be sought for and upheld by the voice of the people if a republic, or the will of the sovereign.” Hence, rulers and civil officers should be equitable and just, broad terms that encompass a trove of character traits: someone who is equitable and just must, perforce, be honest and forthright, which is one of my chief concerns with any elected official. Being equitable and just means regarding oneself as an equal to and a servant of the people: hence, not attempting to deceive the electorate or seek personal gain through position. It means seeking what is best for the country over a single political party, special interest group, or campaign donor. It means they will always put their country and their people ahead of themselves. LDS readers may make the connection with Doctrine and Covenants 121, part of an epistle written by Joseph Smith three years later while languishing in prison, having been betrayed by some of his closest associates. He wrote that “it is the nature and disposition of almost all men, as soon as they get a little authority, as they suppose, they will immediately begin to exercise unrighteous dominion,” (v. 39) which, in civil as well as religious government, consists of undertaking to “cover our sins, or to gratify our pride, our vain ambition, or to exercise control or dominion or compulsion upon the souls of the children of men, in any degree of unrighteousness” (v. 37). Power corrupts, and it is a difficult task to find anyone who chooses to seek after civil authority for the public good yet who can remain untouched by the perks and power that accompany that authority. That’s why the Nephites “did wax strong in love towards Mosiah; yea, they did esteem him more than any other man” (Mos. 29:40) and why King George III described his rival General Washington as “the greatest man in the world”: both men relinquished the power they could have seized. I think I can summarize all this into two qualities: one, honesty; and two, humility—perhaps the hardest qualities to find in politicians of any political stripe. In my mind these qualities mirror those described by King Mosiah in characterizing a righteous sovereign: “If it were possible that you could have just men to be your kings, who would establish the laws of God, and judge this people according to his commandments . . . then it would be expedient that ye should always have kings to rule over you” (Mos. 29:13). He holds up his father Benjamin as an example of this and says he himself has “labored with all the power and faculties” (v. 14) of his soul to reach the same standard. The scriptures give us numerous other examples of righteous rulers—Nephi, Alma, Helaman, Hezekiah, Lamoni, Josiah, Lachoneus, Emer, Melchizedek, Anti-Nephi-Lehi, Enoch—and even righteous bureaucrats and civil servants—Daniel, Nehemiah, Gideon, Shadrach, Meshach, Abednego, and Joseph in Egypt. The Book of Mormon’s oft-repeated promise about our continent—that if we keep the commandments we will prosper in the land—is personified in our executive leaders and their own humility; as Mosiah says, as the king goes so goes the nation (Mos. 29:16-23), and the national decline has visibly followed the moral decline of initially great leaders like David and Solomon, let alone the likes of King Noah, Jezebel, and Herod. We want leaders who are righteous, but that’s hard to gauge. After all, when Samuel was looking for a king the Lord told him that only he could look on David’s heart (1 Sam. 16:7). But trying to look holistically into politicians’ hearts is a dodgy business, so on a very practical level I’m quite satisfied limiting my inquiry to candidates’ honesty and, when possible, perceived humility. The latter doesn’t change much from person to person—all candidates promote themselves with monumental bluster—but the former, honesty, does. James says that if a man misuses his tongue it defiles his whole body; though “a little member,” it can give us insight into a man’s entire soul (Jas. 3:5-8). I wouldn’t want to be judged exclusively on what leaves my mouth, but bearing in mind our limited time as voters and that we’re not judging someone for their eternal disposition but just for a few years in elected office we can look at what they say as a pretty accurate measure of the man. I actually like Mitt Romney. In fact, one thing I'm grateful for in this fall election is that we're genuinely choosing between two moral, decent guys; family men, good folks. This isn't by any means inevitable. It's not terribly hard to imagine this election being between Newt Gingrich and John Edwards, for example. Scary thought, that. I know we're not supposed to like Romney, we liberals… [But I don’t] see his policies as suggesting some core of rottenness in his character. He's a Mormon patriarch writ large. I know fifty of them in my stake. Call him Friday night and tell him you having a moving van arriving Saturday morning, and he'll be there, bright and early, work gloves tucked into his belt, a smile on his face. And it’s kept going of course, with all the force of Citizens United behind it. Mudslinging is unbecoming any candidate, and it is, of course, not Christlike in any way. Here’s a verse (6) from Doctrine & Covenants 134 that I don’t think I’d ever noticed before but which applies specifically to how we citizens should regard our government officials, of either party: “We believe that every man should be honored in his station, rulers and magistrates as such, being placed for the protection of the innocent and the punishment of the guilty; and that to the laws all men owe respect and deference, as without them peace and harmony would be supplanted by anarchy and terror; human laws being instituted for the express purpose of regulating our interests as individuals and nations…” Romney is certainly not honoring the station of the President through this fog of negativity, nor is he paying respect and deference to the laws like the Affordable Care Act that seem to be in his crosshairs. To be sure, President Obama has been dipping in the muck as well, but claims that his campaign are as negative as his opponent’s are more spin than fact. This is all bad enough, but unfortunately it gets worse. Romney seems on track to run the least honest campaign in history as well. There’s Paul Ryan, of course, who’s blatant dishonesty has even drawn criticism from Fox News along with CNN and the traditional suspects, and who can’t even discuss his marathon running without including two lies, about the number of races he’s run and his finishing time, last week trying to clean up the mess by admitting that he just made up the facts. No harm in that, right? Romney is not Ryan, but he is responsible for him and they’re running to be in the same administration. And Romney doesn’t need Ryan's help to dabble in dishonesty. There are the truly famous moments, like taking credit for how President Obama saved the auto industry despite the New York Times op-ed he wrote in 2008 unequivocally condemning government involvement, arguing instead for a “managed bankruptcy.” But there are smaller Etch-a-Sketch moments weaving their way throughout his campaign, on everything from abortion to global warming. The sheer number of lies is unbecoming any candidate, but I'm afraid that it’s downright disgraceful for a priesthood holder; like I said last week, I'm afraid it's rather difficult to not subconsciously hold him up to a higher standard. But I don't even need to do that. In June The Guardian wrote up a laundry list of falsehoods emanating from Romney’s own lips, blaming the President for touring the world to apologize for America (not true), saying the stimulus didn’t create private-sector jobs (it did, over three million of them), saying Obama's grown government (both government spending and the number of government employees are down), saying he’s raised taxes (they’ve gone down), saying Obamacare will consume 50% of the economy (not true), etc., etc. The connections to reality become increasingly tenuous, with New York magazine even publishing an article entitled “Romney Just Making Stuff Up Now.” And that was before the RNC. How bad is it? On Friday Steve Benen at MSNBC published the thirty-fourth installment in his series totaling up Romney’s weekly mendacities. This week Romney told at least thirty-six verifiably indisputable lies. His incredible change of position on healthcare reform—that he wouldn’t get rid of all of it, an Etch-a-Sketch move toward the center to pick up moderate voters—came not just after several years of claiming that he would get rid of all of it, but just one day after claiming on the record that he would get rid of all of it. This week he claimed he balanced Massachusetts’ budget even though he left the state with a deficit. This week he said the federal deficit has doubled under Obama when it’s actually shrunk by $200 billion. And so on and so on, just this week. This is perhaps the most interesting and disturbing element of Romney's tireless obfuscation: that even when corrected, it has little impact on the presumptive GOP nominee's behavior. This is happening at a time when fact-checking operations in major media outlets have increased significantly, yet that appears to have no effect on the Romney campaign. What is the proper response when, even after it's pointed out that the candidate is not telling the truth, he keeps doing it? Romney actually has a telling rejoinder for this. When a reporter challenged his oft-stated assertion that President Obama had made the economy worse (factually, not correct), he denied ever saying it in the first place. It's a lie on top of a lie. If I as a Latter-day Saint refused, on moral grounds, to vote for a candidate who served as the vice-president for a man who got caught telling one admittedly horrendous lie, how can I possibly justify voting for a man who himself told thirty-six equally horrendous lies just this week, many of them again and again and again? Reporters like George Stephanopoulos have given him ample opportunity to repent and come clean, but he refuses to do it. “Thou shalt not lie; he that lieth and will not repent shall be cast out” (D&C 42:21), not elected to the highest office in the land. [Romney’s] people are simply unfit for the responsibility of running the United States. The knee-jerk judgments, based on ideology not reality; the inability to back down when you have said something obviously wrong; and the attempt to argue that the president of the US actually sympathized with those who murdered his own ambassador in Benghazi: these are disqualifying instincts for someone hoping to be the president of the US. Disqualifying. Maybe, maybe not, but it’s certainly troubling. The photo of Romney leaving the dais with a smile on his face didn’t do him any favors. When Captain Moroni’s men were suffering abroad, the chief judge Pahoran wrote him saying, “I do not joy in your great afflictions, yea, it grieves my soul. But behold, there are those who do joy in your afflictions . . . and it is those who have sought to take away the judgment-seat from me . . . for they have used great flattery, and they have led away the hearts of many people…” (Alma 60:2-4) Now, of course Romney doesn’t joy in the death of Chris Stevens and the other American diplomats, but he’s given us no way to know that or reason to suspect it. Hillary Clinton gave a moving and forceful response to the Libyan and Egyptian attacks, akin to these men in 1980. Romney, in contrast, gave a mean-spirited and fallacious attack on President Obama for events beyond his control, then hunkered down this week by saying the attacks would never have occurred were he President and his Republican allies in control of the State Department. Honest? No. Humble? No. Such assertions sound like the “great flattery” described by Pahoran, or those used by Amalickiah (Alma 46:4-5), or by Akish (Ether 8) or Gadianton (Helaman 2). I do not and cannot believe that Mitt Romney is anything like these men. I believe the descriptions we’ve heard of his deep concern for people, his kindness, his charity in the best sense of the word. What I can’t yet do is square that private individual away with this public figure who we’ve seen so smoothly and consistently bend the truth for his personal ends. Of course he’s not evil, but he hasn’t sufficiently avoided the appearance thereof to gain my trust or my vote. And I really wish that the LDS candidate would have set the standard for excellence. I feel America is in better hands with the President who has consistently treated us like adults, expanded executive transparency, and who is already navigating us through these crises. Next, given the events of this week, foreign policy. The DNC is over; it is like saying goodbye to a good friend. But before I say how much I love and respect President Obama, and how inspired I felt listening to him speak Thursday night - "like General Conference come early," (if I can be egotistical enough to quote my own tweet,) and how I felt like his speech renewed hope for America and brushed aside the RNC's mockery and derisive comments of Obama's call for change, like chaff driven before the wind - before I say all of that, I have a couple of complaints to make. But don't close your browser - it is not what you think. I realize that some might have found the tone of the DNC to be too harsh and critical, like this blogger at 1MormonDemocrat, but that's not what I'm complaining about. (I took a bit of a drubbing for my "I like Mitt" post from several days back, so I have no interest in being "nice" and getting more feedback like that.) My problem with the DNC is: WHAT WAS WRONG WITH THE CAMERAMEN? Did anyone noticed how the side view cameras started shaking anytime they panned back from the speaker? It felt like one of the Bourne films, or even worse, that some Republican-leaning small business was trying to sabotage the DNC. Additionally, the camera seemed to find their audience pan shots at the most inopportune times: when a woman was rubbing her nose, or a child was biting his nails, or Michelle was talking to the Castro Wonder Twins, not paying attention at all. And some of the cuts to the audience were so quick, I was constantly wondering if there wasn't some subliminal advertising in there. That said, they seemed to have it figured out by President Obama's speech on Thursday night. In a post script to Thurdsday night, we all woke up Friday morning to some stagnant job numbers; this proved a brisk cup of coffee for the Romney campaign: "If last night was the party, this morning is the hangover." (He probably should have said "this morning is the withdrawal," because we are all missing the DNC a lot.) Regardless, I love it when we Mormons make drinking analogies - I mean, it's the one thing we know so much about. Romney might also have been rumored to say, "Obama's jobs plan is about as effective as giving a cup of sacramental wine to an inebriate," and "the Obama stimulus had money bouncing wildly around the country like a game of beer pong," and finally, "what was in that glass anyway?" And so the campaign continues. Bill Clinton spoke truth this evening; the mists of darkness that covered the land have dispersed and scattered, and America's collective memory of last week's confusion and half-truths (and even lies) at the RNC has cleared. Clinton solidly reviewed and dismissed the misinformation from the RNC speakers, and he highlighted Obama's record in so many areas. View the speech or read the transcript, if you have not already. By the way, the pundits keep referring to policy wonk, and they're saying that Clinton's speech was full of it. Can I admit that I am already tired of the word, "wonk?" When Romney or Ryan say wonk or wonky, it seems like a desperate attempt to sound cool, but it's completely uncool instead. However, Bill Clinton took cool into the 21st century: he had swag. Paul Adams tweeted: "Usually they tell you not to cram in too many statistics. Different rules apply to Bill Clinton. He makes them sing." "Now -- but he has -- he has laid the foundations for a new, modern, successful economy of shared prosperity. And if you will renew the president’s contract, you will feel it. You will feel it. Folks, whether the American people believe what I just said or not may be the whole election. I just want you to know that I believe it. With all my heart, I believe it." This doesn't bode well for Romney and Ryan. President Clinton has given President Obama a load of talking points to take to the debates and every campaign rally from here until November. (And FINALLY we even heard about the proposed cuts to Medicaid!) Having watched three days of the RNC, I am surprised by the tepid drone of the Republican speakers compared to what I have seen in just two days of the DNC. (I am biased here?) I don't think so - check out this article from Smart Politics that reports that Michelle Obama's DNC speech was seven grade levels higher than Ann Romney's. This also is fascinating because Michelle Obama's speech was "written at a higher grade level than all but 11 of the 70 orally delivered State of the Union addresses delivered since 1934." Of course, the Democrats have an advantage because their convention was held a week after the RNC, but more than that: they have the lucky benefit that Truth is back in style and trending on Twitter this week. And we Mormons are taking to the internet, (Twitter and Facebook), our phones, and even to the streets (of Charlotte NC!) 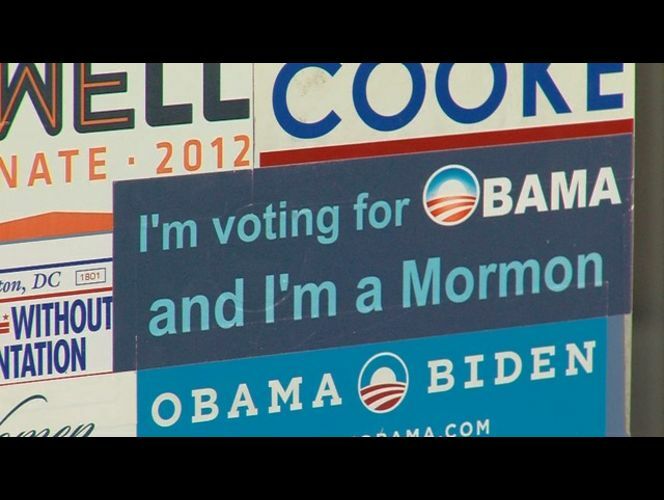 to make clear our message: we are Mormons, and we are voting for Barack Obama for a second term. (See our previous post for links to news articles about the Mormon Democrat gathering in Charlotte.) This article from the Las Vegas Sun may have misunderstood a portion of our purpose when it wrote, "having a Mormon candidate at the top of the Republican ticket will only make it that much more difficult for Democrats hoping to win over the Mormon vote this year. But some felt that even if winning over LDS voters was a longshot, the political circumstances make it worth trying." You see, Mormons have voted for the Republican ticket in high numbers for some time, and having a LDS candidate doesn't necessarily change that. Besides, change, as Bill Clinton aptly pointed out tonight, is a "long, hard road," and each of us will find our own way. (I haven't always voted Democrat, and neither have many Mormon Obama supporters.) So our goals are beyond convincing other Mormons to vote for Obama - (seriously now) - but we aim to add our unique voices to the wealth of diversity of those supporting President Obama; we understand that we are breaking from the expected, the norm, or even the stereotype. However, this also is part of why we hope to make ourselves heard - and to find strength from one another, because we are "all in this together," and we are not "on (our) own." With so many reasons to vote for Obama this November, (and thank you Pres. Clinton for spelling it out so clearly,) we Mormons also feel to press forward and do what we can to get him that second term. In this regard, Bill Clinton asked this question during his address: "Are you willing to work for it?" We answer with the delegates at the Charlotte convention: "Four more years!" Read Hannah's post here to find out how you can get involved. One of the most exciting events of the day was the gathering of Democratic Saints in Charlotte NC to usher in the DNC and recognize the many of us that support President Obama. Those of us who were not there are jealous of course, but we celebrate the unity of Democratic Mormons across our great nation. The media lit up with many articles about this event, and we have posted many of these links at the bottom of this page. MormonsforObama.org will have more coverage of this event in the next several days - so stay tuned.